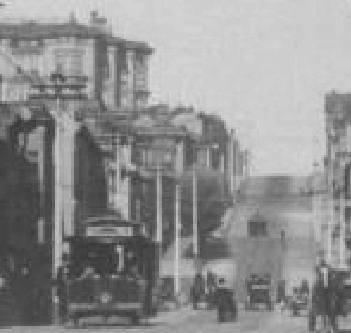 Powell Street car outbound near Post, before 1900 (Source: [group 6:112b], Jesse Brown Cook Scrapbooks Documenting San Francisco History and Law Enforcement, ca. 1895-1936, BANC PIC 1996.003--fALB, The Bancroft Library, University of California, Berkeley). May, 1998 Picture of the Month. opened: 28-Mar-1888. Powell Street from Market to Jackson, Jackson from Powell to Mason. Mason from Jackson to Montgomery Street (now Columbus). Columbus from Mason to Taylor. Taylor from Columbus to Bay (near Fisherman's Wharf). cars: single-ended California cars, and open cars. Cars originally had a single front-facing seat on each side. opened: 05-Apr-1888. Powell Street from Market to Jackson, Jackson from Powell to Central (now Presidio), Central to California. Eastbound: Steiner from Jackson to Washington. Washington to Powell. cut back: 1906. Looped back at Steiner. opened: 1892. Clay Street from Ferry to Larkin, Larkin from Clay to Sacramento, Sacramento from Larkin to Central (now Presidio). Eastbound: Sacramento from Central to East Street (now Embarcadero). extended: 15-Feb-1894. Sacramento from Central to First Avenue (now Arguello) Arguello to Lake. Lake to 6th Avenue. 6th to Fulton at Golden Gate Park. This extension was made to reach the Midwinter Fair. It used an extension of the MSR McAllister cable. cut back: 1902. To Walnut. cut back: 1907. To Fillmore. After the Earthquake and Fire of 18-April-1906, service was restored in 1907. One way portions reversed, East on Clay, West on Sacramento. Loop at Ferry. Tradition has it that this was done so that customers could reach the Fairmont Hotel from the Ferries without walking uphill. More likely, it was so cars would not run against traffic at the Embarcadero. cars (after 1906): double-ended California cars. See below for details. turntables: single track. After 1906, shared trackage in Ferry Loop. notes: This system had a split personality. The original lines on Mason and Washington/Jackson went nowhere near the Ferries or the Cliffhouse. In fact, the original cars that ran on Powell were lettered "Powell Street Railway". 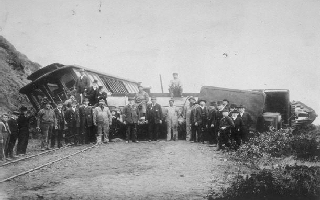 Truth in advertising came into effect with the building of the Sacramento/Clay line and the connecting steam dummy lines. Read about the company's connecting steam dummy service in "When Steam Ran on The Streets of San Francisco, Part I," by Walter Rice and Emiliano Echeverria. 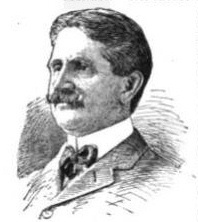 Howard C Holmes designed the company's lines and powerhouse (Source: The National Cyclopaedia of American Biography, Supplement I, 1910). There have been proposals to extend the terminal of the Mason Street line from Bay to Fisherman's Wharf. When the line was built, it ran to the waterfront, but landfill has extended the waterfront three blocks. Walter Rice's essay Is It "Mahoney" or "Mahony?" explores a mystery about the brothers Jeremiah and John J Mahony, who built the original Powell Street cars. Thanks to Robert Bailey, we now know the answer. 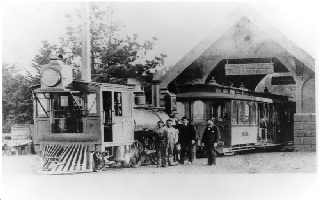 The Sacramento/Clay line replaced the Clay Street Hill Cable Railroad. 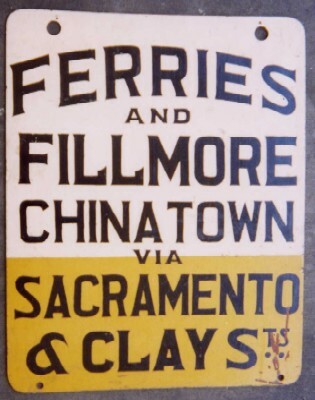 The Sacramento/Clay line was replaced by buses on 15-Feb-1942. Sacramento/Clay dash sign. From the collection of Val Lupiz. 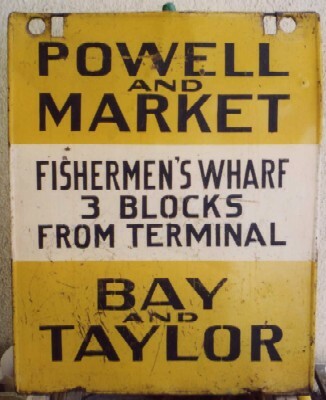 Powell/Mason dash sign. From the collection of Val Lupiz. 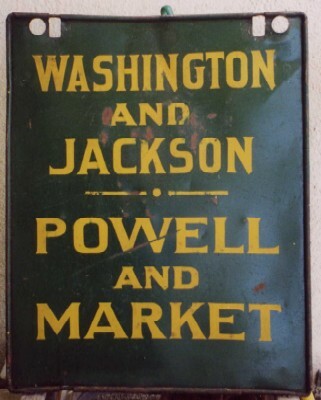 Washington/Jackson dash sign. From the collection of Val Lupiz. The Washington/Jackson line was replaced by the Powell/Hyde line. The system was almost completely destroyed by the earthquake and fire of 18-Apr-1906. The cars which currently run on the Powell Street lines survived because they were in a barn at Sacramento & Walnut. 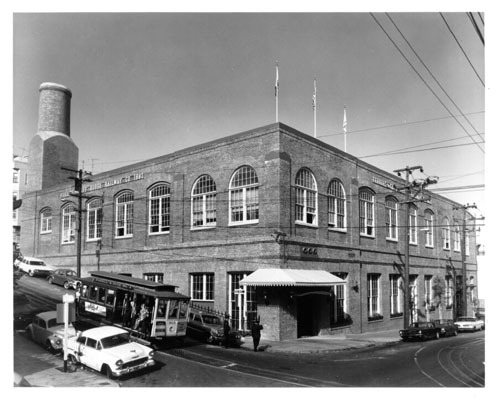 The three-story powerhouse was levelled and was rebuilt as a two-story building. The powerhouse was rebuilt again in the mid 1980's. The crossing at Powell and California is controlled by a manned signal tower. Read Emiliano J Echeverria's article about the tower. "The Song of the Powell Street Grip", was originally printed in the Market Street Railway's house publication The Inside Track, March 1923. It was reprinted in San Francisco's Powell Street Cable Cars by Emiliano Echeverria and Walter Rice, Arcadia Publishing Co. October 2005. Sacramento/Clay cars reached the car barn by 2 blocks of track on Stockton from Sacramento to Washington. 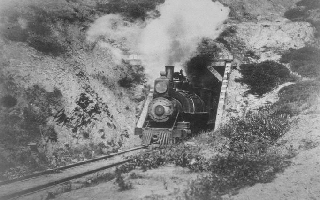 The FCH operated a steam dummy line from the end of the Sacramento/Clay line, out California Street from Presidio to about 33rd Avenue, through a tunnel, and around the cliffs on private right-of-way to a terminal at 47th and Point Lobos, near Sutro Heights and the Cliff House. There was a branch on 7th Avenue to Fulton, at Golden Gate Park. The small wooden station building still exists in the park. FCH roundouse at California and Laurel, 1895 (Present site of Laurel Village) (Source: [group 4:33a], Jesse Brown Cook Scrapbooks Documenting San Francisco History and Law Enforcement, ca. 1895-1936, BANC PIC 1996.003--fALB, The Bancroft Library, University of California, Berkeley). 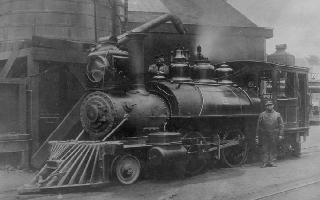 FCH locomotive at California and Laurel water tank, 1895 (Source: [group 4:34a], Jesse Brown Cook Scrapbooks Documenting San Francisco History and Law Enforcement, ca. 1895-1936, BANC PIC 1996.003--fALB, The Bancroft Library, University of California, Berkeley). FCH tunnel near California and 33rd Avenue, 1895 (Source: [group 4:33b], Jesse Brown Cook Scrapbooks Documenting San Francisco History and Law Enforcement, ca. 1895-1936, BANC PIC 1996.003--fALB, The Bancroft Library, University of California, Berkeley). FCH (Powell Street Railway) station at Golden Gate Park (7th & Fulton). The structure still exists (Source: Recreation and Park Department Archives). FCH wreck on Land's End right of way (Source: [group 4:32], Jesse Brown Cook Scrapbooks Documenting San Francisco History and Law Enforcement, ca. 1895-1936, BANC PIC 1996.003--fALB, The Bancroft Library, University of California, Berkeley). 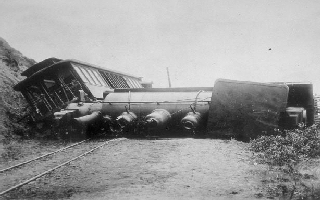 Another view of the same wreck (Source: [group 4:31], Jesse Brown Cook Scrapbooks Documenting San Francisco History and Law Enforcement, ca. 1895-1936, BANC PIC 1996.003--fALB, The Bancroft Library, University of California, Berkeley). The line around the cliffs was electrified in 1905 as part of the 1 California streetcar line. The cliff portion was abandoned due to land slides on 07-Feb-1925. A trail covers parts of the line. Along the trail, and visible from the Land's End parking lot, are the foundations of a small station building. Ferries and Cliff House roundhouse at California and Laurel. California Street on the left. Locust would be above the top of the image and Laurel below the bottom (Source: Sanborn Fire Insurance Maps, San Francisco, 1899-1900, Vol 4, Sheet 399). The Library of Congress' American Memory Project has a film taken from the front of a steam train heading East from Land's End towards California Street, to connect with the Sacramento Clay line. 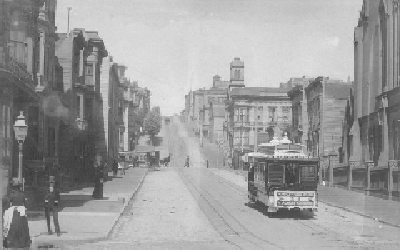 Powell Street car inbound near Geary, before 1900. Another inbound car is visible farther up the hill (Source: [group 3:25], Roy D. Graves Pictorial Collection, ca. 1850-ca. 1968, BANC PIC 1905.17500--ALB, The Bancroft Library, University of California, Berkeley.). 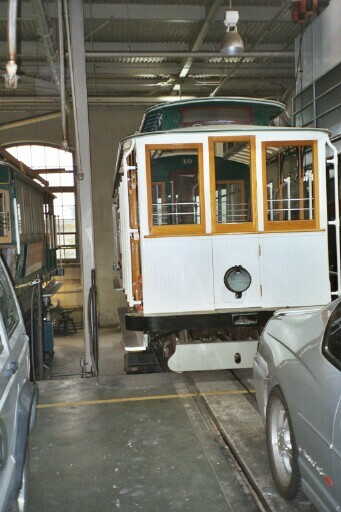 Former Sacramento/Clay Car 19, in storage at the Washington/Mason car barn. December 2003. Photo by Joe Thompson. Car 16, was on display on the roof of the Emporium department store for many years. Val Golding reports on the cable car email list that it was broken up for parts which are in storage. Car 18. Converted to a motorized cable car by Gridley Realty, along with several former California Street cars. Car 19. Preserved in the Washington/Mason barn, but is not on display. Car 20. Stored at the Western Railway Museum at Rio Vista Junction. It had been a ticket booth at Fisherman's Wharf, had been used for something at Lake Tahoe, and wound up sitting in a wrecking yard in Medford, Oregon. Car 21. Converted to a motorized cable car with one open end cut off. Owned in the early 1950's by Gus and Harold Geister of the Marin Truck & Storage Company. Car 22. A car that had been used on the Peninsula as a flower shed. The owner displayed potted plants in the open ends and used the closed section as a work shop. It was at the Western Railway Museum in the late 1960's or early 1970's, but previous ill treatment had already caused it to deteriorate beyond repair. Car 25. 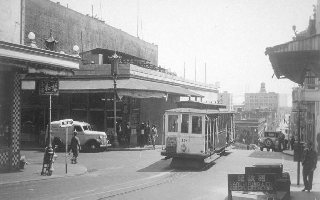 Converted to a motorized cable car by Gridley Realty, along with several former California Street cars. MSR Sacramento/Clay car on Sacramento at Grant. This was the line, built by the FCH, that replaced the original Clay Street Hill line. The original caption says 1920 but the cars look more like those of the Thirties [group 2:19], Roy D. Graves Pictorial Collection, ca. 1850-ca. 1968, BANC PIC 1905.17500--ALB, The Bancroft Library, University of California, Berkeley. Sep, 1998 Picture of the Month. 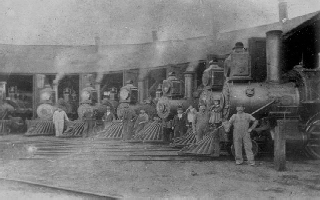 Washington/Mason powerhouse in 1899. Mason is at the bottom of the map and Washington is to the left. (Source: Sanborn Fire Insurance Maps, San Francisco, 1899-1900, Vol 1, Sheet 53). Washington/Mason powerhouse and carbarn before 1906. Notice the third floor, which was not restored after the Earthquake and Fire. (Source: San Francisco Public Library, San Francisco Historical Photograph Collection, AAC-7827). Washington/Mason powerhouse after 1906. Mason is at the top of the map and Washington is to the right. (Source: Sanborn Fire Insurance Maps, San Francisco, 1913-1950, Vol 1, Sheet 57). Washington and Mason in 1967. (Source: San Francisco Public Library, San Francisco Historical Photograph Collection, AAC-8149). Market Street Railway's carhouse on Sacramento between Central and Walnut in 1899. The 26 Powell Street cable cars that survived the 1906 Earthquake and Fire were stored here. On the left is the carhouse used by the Ferries and Cliff House's steam trains (Source: Sanborn Fire Insurance Maps, San Francisco, 1899-1900, Vol 4, Sheet 395). 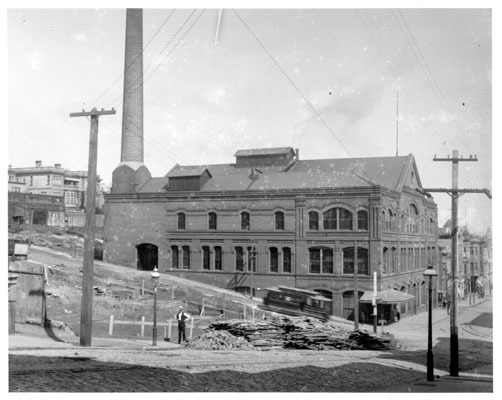 Sacramento/Central carbarn in later years when it was used for storage and a company gymnasium (Source: San Francisco Public Library, San Francisco Historical Photograph Collection, AAC-8385). This video, taken on 22-March-2007, shows car 17, built in 1887, running outbound from Geary to Post, passing the Saint Francis Hotel. Click arrow button to play video. (Adobe Flash is required. Some browsers will require two clicks to start the video.) See more videos on my Cable Car Video page. Main 1868. Holmes, Howard C., Chief Engnr. S.F. Dry Dock Co., Ferry Bldg. Baker 956. Same [Holmes, Howard C.], r. 2522 Green. Dedicated volunteers at San Francisco Genealogy typed in every page of the book. Copyright 1996-2008 by Joe Thompson. All rights reserved.